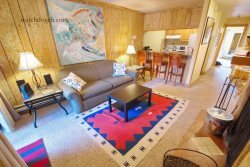 Cute 2 Bedroom Condo located across from Crested Butte Ski Area! This condo is located in beautiful Mt. Crested Butte, CO and located across the street from the base area! It’s a cute and conveniently located condo for a great price! The free shuttle picks up every 15 minutes and goes into town and back, which makes it convenient to enjoy the unique shops, restaurants, and nightlife Crested Butte has to offer! The Alpine Condo is located on the ground floor of the complex. Its open layout is great for entertaining family and friends. The balcony, which opens up from the kitchen/living area, is a great place to take in some fresh mountain air! It includes dining room seating for six, a remodeled and open kitchen with stainless steel appliances, and a very comfortable living room with a gas fireplace for relaxation! Down the hallway you’ll find two bedrooms which are both furnished with queen beds and spacious closets. Both beds have been updated for the Winter 2017 season with all new comforters and duvet sets! Across the hall from each bedroom, you’ll find two full baths. Other amenities for this property include views of Mt. Crested Butte, high-speed internet, television, and the ever-convenient washer/dryer. Don’t pass this property up for your Crested Butte vacation. One complimentary parking pass is provided. Please note that the parking lot is first come, first serve and the parking pass does not guarantee a parking space. During the winter season, parking may be limited due to snow removal and storage.